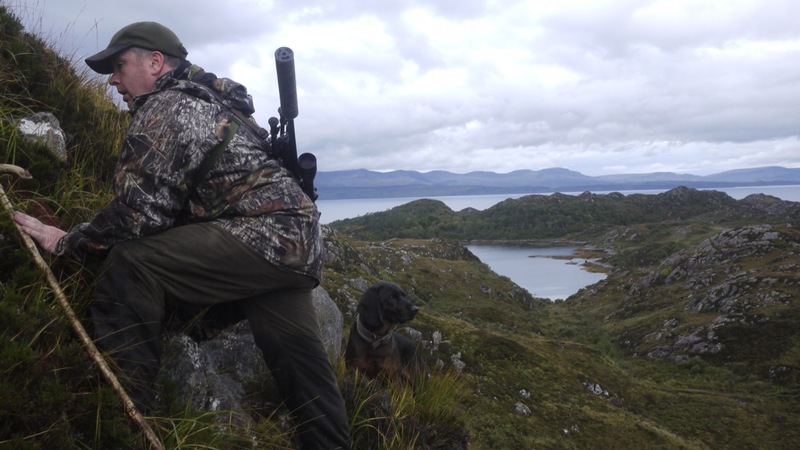 Early in January Dave came back for his second year on Rona stalking hinds. This time as my helper. A welcome hand and as we planned we had our fingers crossed for good weather as we enjoyed last season. We were not disappointed with a great week of weather with I think only one poor day. We have a DMG in place (Deer Management Plan) which means we monitor our deer having a deer count every second year but we are always assessing when we are out on the ground, whether stalking or working. We keep the numbers at a level the Island can stand and to the benefit of the herd. 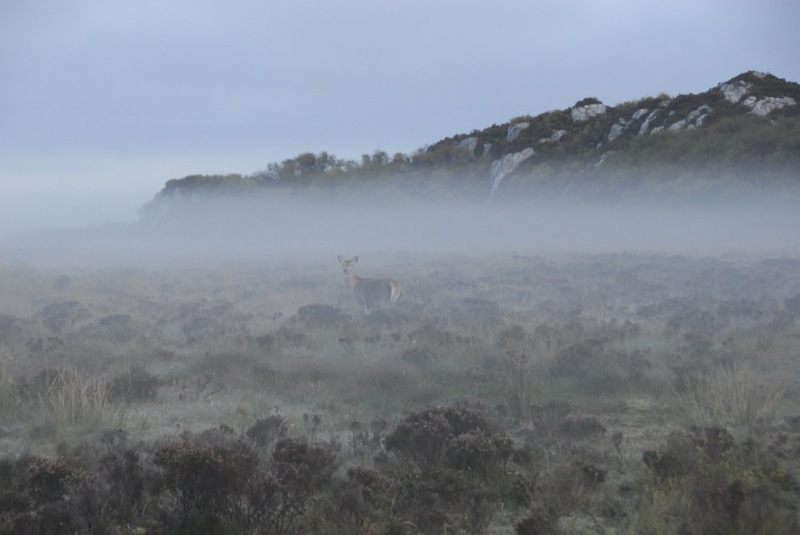 We keep an eye on the health of the deer, the grazing pressure and the ratio of stags to hinds. Just the same as the sheep we keep here, the deer need to be managed. The success of the introduction of Red Deer to Rona is there to see, unbeknown to me there were a ‘few’ red deer on Rona before the 8 came from John Fletcher’s deer farm in Auchtermuchty in 2003. However I do believe deer from Raasay were regularly coming and going here long before I got here and still it continues. With visiting stags seen often in the rut swimming over. Unfortunately we know our swim the other way but it is swings and roundabouts. So off we set on our first day on the first week in January. We had a figure of ten hinds and calves for the week, I had been culling a few prior to Dave’s visit and I hoped to get to a figure of 20 for the season. We prefer to cull our hinds early in the season so as not to disturb them when the weather is poor but life got in the way and we were lucky to have this week and lucky to enjoy good weather which was a bonus. We quickly accounted for 4 and as last year we were struggling to find ‘poor’ or old hinds that met the normal cull criteria, the hinds here are easy to age as we know when the herd started to establish itself. We do not shoot any of our original 6 hinds and I can for sure say that 4 of them are still alive, in fact I’m fairly sure that 5 are. This may sound not good practice to leave these old hinds but they are the ‘old girls’ of the herd, hefted to the Island now and are able to teach the young ones where the best lies are, the best places to shelter and to feed. So they are really worth their weight in gold. If we see them failing then for sure we will cull them. As it happened we had three hinds with calves and 4 yeld (or and young) hinds. All were in good condition which would have seen them through the winter. The ones I butchered before and after Dave’s visit still had a fair amount of fat on the carcasses. It sounds pretty mean to shoot calves but if the calf is not shot it will not develop to its full potential should it survive. They are not feeding from the mother on Rona at this time but it relies on its mother and we would not like to orphan a calf, although in this harsh environment it does happen. Dave worked very well and took charge of the gralloching and larder work freeing me up for all the jobs that go on in the background (Like windmill repairs!!!). Stalkers out on the hill at this time enjoy fantastic seasonal views and seeing nature at its rawest. It is good to see on social media the reporting and pictures of ‘Life on the Hill’. Surely it will give the layman (or woman) an idea of what we do, some of the snow pictures lately will show how hard it can be, but still an enjoyable challenge. Unfortunately there are an awful lot of bad things to be seen on the hunting shooting media platforms too!!!!! 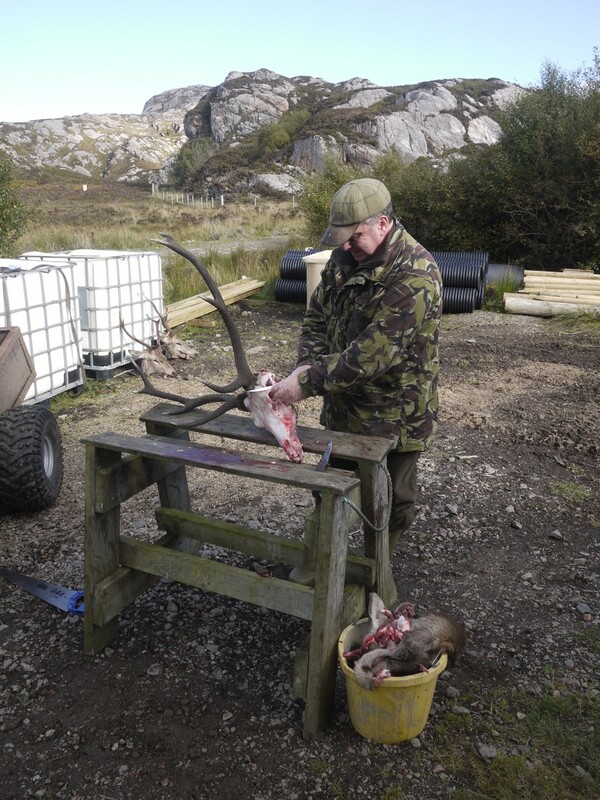 At the end of our hind stalking week we had achieved what we had set out to do, Dave went back to Ireland for a rest and I set about butchering. Most of the deer went away to Fyne Game based in Dingwall, who pick our deer up on the pier every year without any problem. Grazing pressure was minimal, wind damage to trees much greater out here, regeneration is still getting away and one of the huge helps that we inadvertently enjoy are a huge network of deer paths. This makes wandering over the hills of Rona much easier and more enjoyable. I’ll continue to pick away filling the freezer with a quality product totally organic, grown on Rona for sale in the coming year to our visitors. Building a house on Rona and being on site every day does not lend itself to thinking about taking guests out stalking. But, there are stags to shoot and the first week in October was booked late the previous year before we got into the house build so there was a bit of, wait and see. However I had our usual stalker, Wallace coming and to let me away I had asked Dave MacCullough to help out and he was more than willing. As it happened Dave had an unexpected family commitment to attend to and at the last minute was unable to come. So, I downed tools and went stalking. Probably the best thing as it got me away from the house and let me get out to do what I enjoy best. Our regular Danish party had re-booked from 2016 and we were delighted to see them back hoping for a good week of weather (or better than the previous year) and some good stalking. The previous year the weather had been dire and the group had to leave early so as to not miss their plane and as well they did as the wind really blew. This week the weather looked favourable and we were off to a good start. Spying the North West corner. Our first day took us North, the other party heading in the opposite direction.We tramped a fair bit North bumping a few deer but nothing was showing that warranted a bit more than passing interest. We were up on the tops and the wind was pretty cool, with very cold showers, we spent a long time spying and as happens it seemed all was in vain and time to think about heading home when we heard a roar. Not in front of us but it seemed to come from the way back to Dry Harbour. Peter had just passed round the chocolate when the faintest of roaring came. We had been looking down on hinds below us but no stag, a quick spy East and there was our stag. We quickly figured that it was a shootable cull stag and it was game on. It was Peter’s stag so we took off together leaving Finn the third member of our group trailing behind with gunslips, rucksacks, cameras on his back. According to the rangefinder the stag was 700 metres away when we saw it first and the stalk looked pretty straightforward. But as usual it was not that easy, the walk in was good but then the rain came on and the stag moved, we had open ground to cross and I made it over but in the meantime the stag moved higher and Peter had a bit of a job blending with the terrain to get over to the cover I was in. 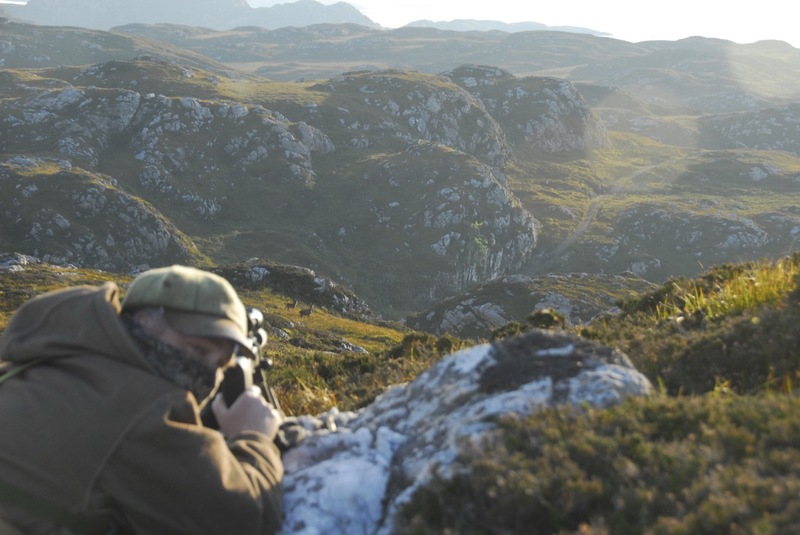 A short stalk in took an age and the firing position was not ideal, we felt our stag must go but on coming out to the small ridge in front of us we had some heather to give us cover and Peter took the shot. A good result and we had a surprisingly run stag relatively early, he had been rutting discreetly for a while. Calling back at the holiday cottages we were surprised to see a family group feeding in the garden but they did not hang about, clearing the fence and heading into the forest, pronto. 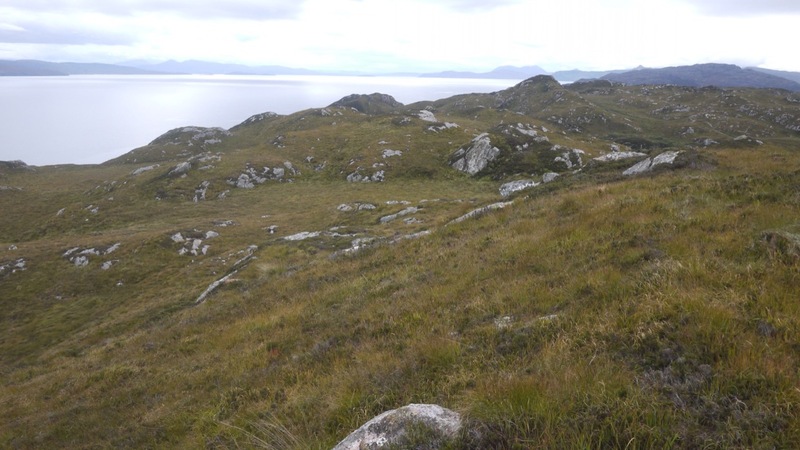 After a couple of days out stalking we were not seeing deer so we had an idea to look on one of the Islands around Rona where the deer spend their summer, we found plenty cast antlers and saw a few stags leaving but our stalkers on the mainland did not see them despite being on higher ground. Ah well better luck next day. It was a tough start to the week looking for stags but Wallace had a good stalk along the East side coming onto a good stag which they managed to stalk into and shoot without any problem. On the way there they passed some real good stags and were quite excited with what they saw. I decided to head South with Per and Peter the next day after seeing the stags leaving the Island, we had a thought that there would be a stag in the South end. Again it was very quiet without any roaring or hinds about, we had bumped a couple of stags on our way South to look on the small Island the day before so we were getting a bit frustrated as it is the time for action. Then everything changed, we spied a very good stag on the SW peninsula. A long stalk in with several detours, then a scramble along a cliff clinging onto the heather which was quite exciting led us up a small valley to a knoll slightly too far for me from the stag but something had lifted the stag, perhaps another stag and the stag and hinds started moving off to the East. Luckily the stag came within range, the stag stopped, roared and Per had a very good clean shot and we had stag number three. That was when the battery on the camera ran out of power, so no pictures!! On the Wednesday we decided to all go out together, a bigger party but only four, we headed South but the wind was wrong, once we reached the middle of the South of the Island we headed East and back up towards Church Cave. That was when we saw a very good stag, which we think was one we know as Torn Ear. Having that distinction no doubt picked up in a fight the previous year. This was definitely a cull stag (for other reasons!) and off we went. There was an awful lot of open ground but we made it into a position where the guest and stalker were to go forward alone, having seen the stag follow the hinds down off the hill to the edge of the valley. I held onto Wallace’s dogs and Peter kept me informed as he followed our guest with his binoculars, then we waited, and waited!! After a good while Finn and Wallace came back. There was no sign of the big stag but the hinds which he had been with were lying down thirty metres in front of them chewing the cud. We waited a little while longer then carried on, obviously something had taken the stag away but not us it seems, we will never know. Finn Looking For Torn Ear. We went high to see if we could find our stag but he had disappeared. Nothing for it but to head home and call it a day. The wind had swung North and it was bitterly cold. Next day the guys set about cleaning their trophies and Wallace took Finn North. We were looking for a one antlered stag and as we had not seen him anywhere I felt that he may have moved up the North East side and was rutting there. An hour or two after they left we heard the jeep and it was Wallace, they had had a successful stalk and surprise, surprise they had shot the stag with one antler. He was a big stag but with the broken antler there is always the chance he could stab another stag if they went head to head fighting. The rest of the week was spent cleaning heads and out fishing, spying for stags and I’m sure the guests were hoping I would see something that we would have to shoot. They had their number, but with no other stalkers this year there is always a chance that something cullable will appear. The Europeans often clean the head and for transport cut the antlers off close to the antler base, screwing them back on and mounting them when they get home, makes for easier transportation on the plane. Round at the West side we saw Torn Ear, lying down not really looking like a rutting stag, some hinds above him. We spied him from the boat and he tried his best to avoid our attention, lying flat out to try to blend in. He’s pretty smart and a cracking stag. 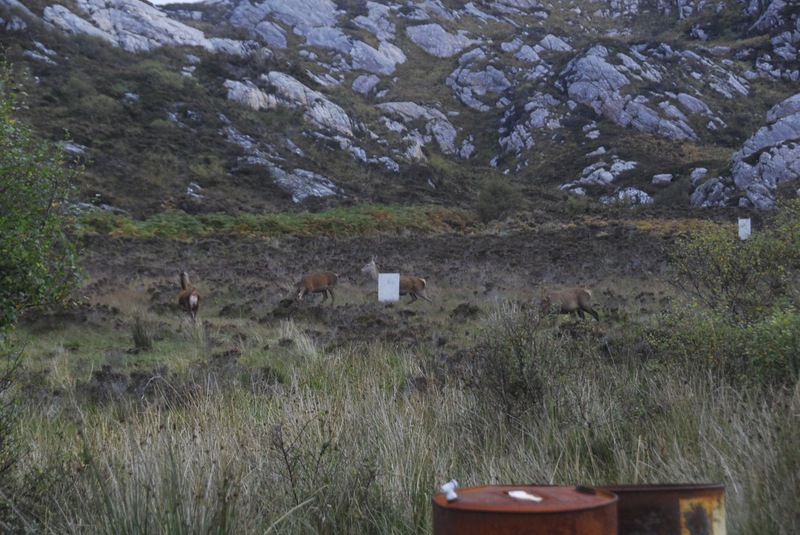 On the Friday we had guests arriving and Wallace took the stags that had been shot to Portree one day early. The guys gave us a hand to load and the game dealer was waiting in Portree for them, a successful week. It was a good relaxing week. Next day, Saturday the boys were off and we hope to see them again. The rut continued with some good stags turning up but no guests or time to shoot them. Never mind we do not have an over abundance of stags, hopefully they will be here next year. 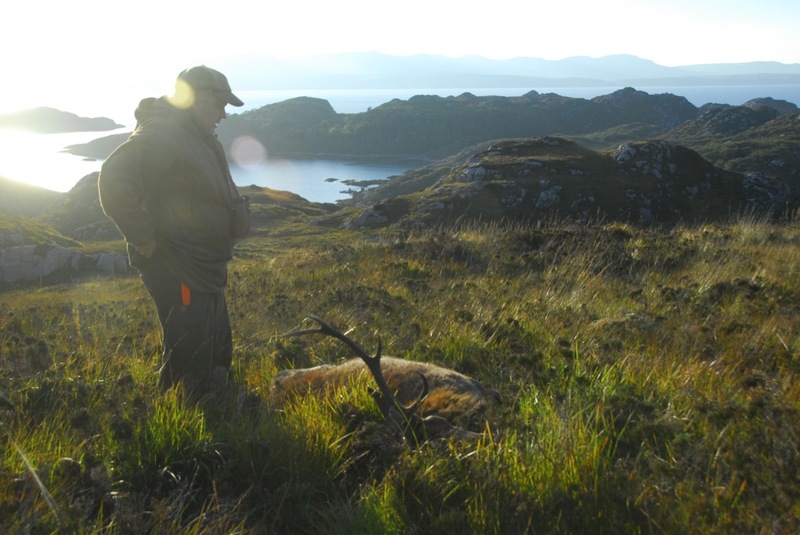 One of last years ghillie’s Mark came for the last week of the season to shoot two young stags for the freezer and reported quite a few very good stags rutting all over the Island. We saw this fellow with hinds later on and we don’t know where he was hiding on Rona, I think up North but he has since disappeared, hopefully he has gone back to his hiding place. Overall a very good season (only one week of guests) but the 5 weeks or so of stag activity was good to see and we look forward to next years stalking week. Back in December we had a first, Dave Mccullough from Northern Ireland was here for a weeks hind stalking. Dave is a keen stalker, he visits Scotland for stalking holidays (and working stalking breaks). I read his article in an Irish sporting magazine and contacted him, he sails too so in the summer he arrived here had a walk all over the Island and decided to return in the depths of winter for a weeks hind stalking. Usually the weather in the second week of December is pretty rough but Dave was blessed with a mixed week but better than mixed, ideal for stalking. This was the first week with a hind stalking guest, the bunkhouse was all renovated with shower, hot water and toilet recently installed so Dave took up residence for a week there. We started more or less as soon as he arrived. 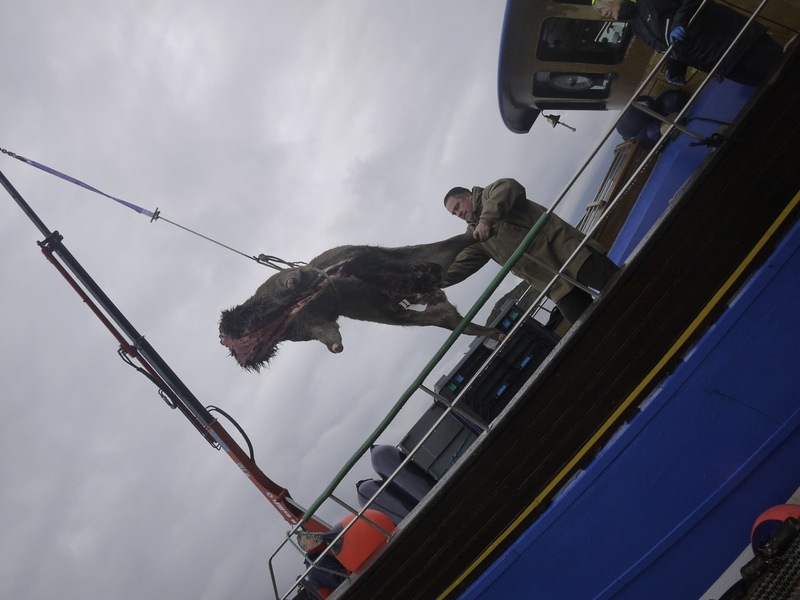 It took a while to get onto our first cull hind but Dave carried out the shot quickly and efficiently. The thing is that stags in the late weeks of September will let you know where they are with their rutting behaviour. But hinds are a different stalking experience completely. In fact most experienced stalkers would prefer the week at the hinds but the trophy for some is all important. For me it is all about the stalk and that is personnel. You don’t need the antlers on the wall to say, yes, that was me. You just keep these days or weeks in your mind, a memory that will last forever. Well, I have just found this post on Autosave!!!! (Wednesday 6th of December 2017) Just shows me how much off the ball I have been since the house build started. What an amazing contrast to the weather we have this year and now, which is almost the same week in December as last. I’ll have to try to remember this week a year on, but as I say stalking memories are sometimes etched in your mind and this week with the great weather was one of them. We looked very hard for poor hinds and settled on ‘just a few’ as the numbers heading to the optimum number for Rona could stand another year without high numbers being shot. Given that I would cull some in January to stock up the freezer for 2017 season. One of the best stalks of the week was after a long day spying and failing to find anything. On our way back from the North I spotted a hind and calf. It is best to shoot both as we would not like to orphan a calf and this is the part that makes hind stalking with guests not very easy. If the rifle has to shoot then ideally he/she would shoot the hind first then the calf quickly. But what can happen is that the guest hesitates and the calf runs away which is not a good end to the stalk. So it was decided we would stalk in and I would shoot the calf as soon as Dave shot the hind. (Some Estates shoot the calf first and that debate will go on forever). The stalk was going well even although we were blind all the way in. We had headed away from the deer then back into the wind, crawling out of a valley to our chosen spot. Hoping the deer would still be there. Once we were set up we had two clear views and quickly took our shots, the result was perfect and we were quickly back at the larder, tired after a long day but pleased with our efforts to manage the hind population of Rona during this December week. We had decided to have a day off and spent a lot of it packaging up three trophies from a stag week in October into our home made packing case with a view to sending them to Denmark on Dave’s return ferry. The weather could not have been kinder, hard to imagine that on Wednesday the 6th of Dec’ 2017!! It was sheep feeding time and as usual Julie arrived, this time with that years calf, her daughter from the previous year in tow. All in good condition and always an issue, ‘pet deer’. Although ‘Julie’ gets sheep nuts (long story) we do not encourage the deer to come to a feed here, there is plenty of natural forage and it is not good (in my opinion) to feed the deer. There are good reason on other Estates where I understand fully their management but it is not necessary here. Finally at the end of Dave’s week we had a very easy spy of hinds feeding away to the East of the harbour and on stalking into them we came on open ground which meant for a long crawl. I stayed back and Dave went forward as we had discussed the hind to shoot, but on route more deer appeared and I was unsure that the hind picked may have had a calf but once the shot rung out and I got the signal all was well. I was pleased to hear (and see) that there was no calf, an ideal hind. All that was left was for the deer to go to the game dealer who would pick them up in Portree and Dave to head back to Ireland. Our cottage guests who happened to be here from Australia and going off on the same boat were intrigued to see how it all happens here in Scotland. September 2016 The Rut Starts Here. This is the time of year that is the best time for being on the hill or out and about. Autumn is under way, officially yesterday (22nd September). I like to have a prowl about before the stalking guests arrive and I have not been disappointed this week past. We are responsible for maintaining a healthy herd of Red Deer on the Island and with the growth from a small start reaching the point of leveling out to a sustainable population. This year was always going to be an unknown, but we did hope to have enough of a surplus to give us a steady supply of venison without compromising the regeneration. Arriving at the cottages at 7am one day here was this cracking stag but he has been living around the cottages since he was a calf and I think he may be troublesome come the rut, so he had better not hang around!! He is obviously doing well on the grass. He is in the company of this young stag, they are often together. We spotted his left ear is torn so………….must have caught it but as I well know, antlers can look blunt but are hard and can be sharp enough. As is often the case on places that hold deer there is a market for stalkers who have an interest in the stalk and deer to come and stalk. It is a vital part of Highland Estates income, we hope to manage our herd to sustain this income for the benefit of the herd and the Island. Knud was over with two friends four years ago and had a real good time. They were successful then and had a pretty good time so here they were with two new visitors. They had arrived on MV Aspire on a full gale pouring rain day. But we have to try out the rifle despite the rain which quickly turned to torrential. Once the rifle and target was tried out a quite wet party headed over to their accommodation. Back to Big Harbour to find one of the drains blocked and the water running down the road, and it is only September!!!!! We headed out about 4pm for a look around and saw many deer but not the ones we wanted to cull. Never mind the view was quite spectacular late on. Sunday 23rd October: I’ve just realised that this page automatically uploaded, so I’ll need to fill in the story, hopefully later tonight.Well this was the 24th September picture below and above and this last four weeks have just flown by. Quite scary!!! Day one with our first stalkers, I had said to our group that we could not go North as the wind was too strong (coming from the South) to use the boat. Knud’s reply was you get us to a stag and we will worry about getting it home, which was very kind of him as I for one did not relish a long drag from an inaccessible place. As it happened we headed North with the wind up our backs and hoped that when we turned into it we had not cleared the ground. The valley was kind as we walked North and the wind just whistled straight ahead. I was confident as we turned East that we would get onto a shootable stag. 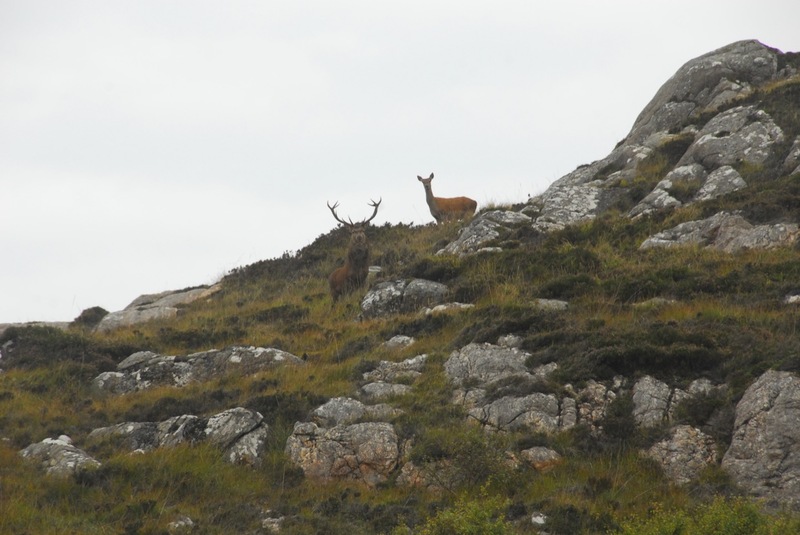 Very quickly the scenario changed, even after spying the corrie we were heading to and finding nothing, two stags appeared out of thin air and the second of the two was a (Rona) cull stag. Our Danish rifle that day, Helge successfully took the shot and then the real hard work began. With over a kilometre of hard drag ahead, pictures were taken and the four guys started pulling. I headed off to get Per, another of the party who was fishing to help us with the pull. When we returned the guys were on the strimmed path which was getting close to the bike, a short pull with a little help from myself and Per and we were back at the bike. An hour later we were back in the larder the stag weighed in at 120 kilo’, a wee dram was taken as is the custom and the stag was cleaned out then hung ready for the game dealer, Fyne Game. 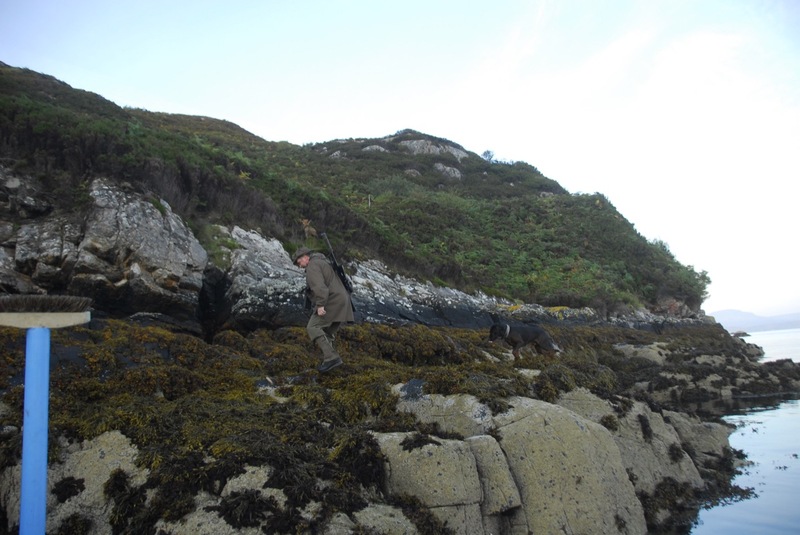 Next day it was Finn’s turn, a very long walk in the morning on the South of the Island was frustrating after walking onto a good cullable stag, schoolboy error but then it is not that easy at this time of year. So after the previous days walk I only took Finn out in the afternoon. A half chance that we could see something on some undisturbed ground turned out to be a good chance and another 10 pointer was hanging in the larder. Finn’s first stag and a short drag for once. Next day 27th Sept’ it was the North West corner’s turn for a spy, the weather was grim and quite a few deer were seen but it was pretty quiet, however we did come across this young stag near the end of our walk. We had a good stalk in and Peter had a successful shot. Not the best head but for the week the best stalk which for me is what it is all about. Although the weather was very unpredictable during the first week of stalking the forecast was very clear, more gales coming. So that was the end of our first party’s week, they had to go off a day early, what with planes to catch there was a chance of missing it so no risk, better to go off early. The morning before they left we had a tour on the boat and along the shore wed saw the biggest stag of the week, of course that did not help that they were going away but we would not of shot this stag and we named it the TV Screen due to the shape of its antlers, so the tv screen was left to do what he does best at this time. The wind had got up so after lifting creels we decided to have a go at the fishing, by this time in the bay as it had got pretty rough outside. We caught quite a few Coley good for bait and all to soon the boys were loading their stags to meet the Game Dealer and heading back to Portree in an ever increasing wind. I had a few days before the next guests so was out next day looking to see what was on the ground. Plenty young stags, in fact I wondered how there were so many but this year has been quite a revelation, the population has reached a point where we will increase the cull. The Island could I guess handle more but we have a sustainable population at the moment and after much discussion we will stick with the current number. The weather forecast for the first week in October was looking good and quite a transformation from the mini winter week we had just experienced. In fact after the rain the warmer weather gave us an early morning fog and it was good to see the master stag from two years ago coming out of the forest early in the morning. He looked pretty stiff and I could not work out if it was old age or he had been fighting? One phenomenon we have seen this year is very late calves, quite a few still with their spots and quite small. Maybe it was the weather last year, it was a very strange year with no real sun or heat and quite grey a lot. We had no guests last year so culled our own stags making less disturbance. Who knows, I have heard of other forests with late calves so I don’t think it is unique to Rona? Our next guests were arriving on Monday, a party of twelve and only two stalkers in the group. But early morning forays are a must during these weeks just to see what is happening and I was not disappointed to see many stags on the go, not all mature or cullable but good to see. Of course the bonus is the sunrises at this time, you do not need to get up in the middle of the night or stay up late for sunsets. I also think the red is much deeper at this time of year, I never get tired of them. I came back after this mornings outing for Lorraine to tell me we had a hind in the garden, which is good for keeping the grass down but it also meant that it was quite possible a stag would be calling giving us a sleepless night (quite common at this time of year). Again another sunrise, much the same as the last but every one has its own beauty, great to be out on lovely mornings. The weather from a week ago had changed completely and our Danish guests were amazed with the lovely ‘Summer’ weather, the wind was cool but it was so good to get a full week of sunshine. As usual everyone had to show they could handle the rifle and there were no issues, so we set off to the hill quite soon after they arrived, only three days to get our two stags. After a very long walk up in the North West corner, with one stalk where we got onto a good 10 point stag, we stalked him quickly then lay down to crawl forward for the shot only to find we were in half a metre of heather, stalk unsuccessful. We then had a spy back to Dry Harbour and finally got onto two shootable stags. We stalked this one a poor young stag which it turned out would not have made a good mature animal, good choice (covered in tick). But as we stood down after the shot another good cullable stag got up to the left of this one looked at us with disdain and shot off, it pays to really look around but the final approach had to be hurried, nothing lost. 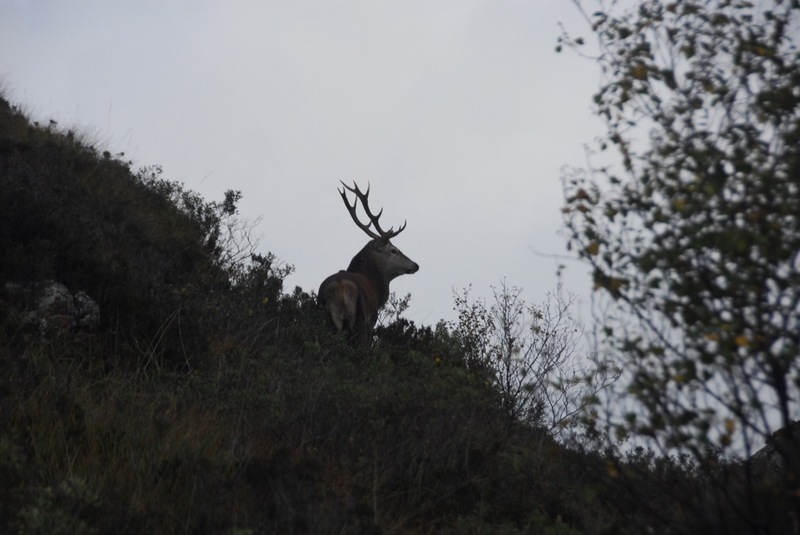 Karl Johan had a stag and as we were gralloching it we spotted another very good stag a good 800 m away back up North. It was Oscar’s (on the right) turn to stalk but unfortunately I left my camera on the bike as we passed on route to approach this new stag so no photos. 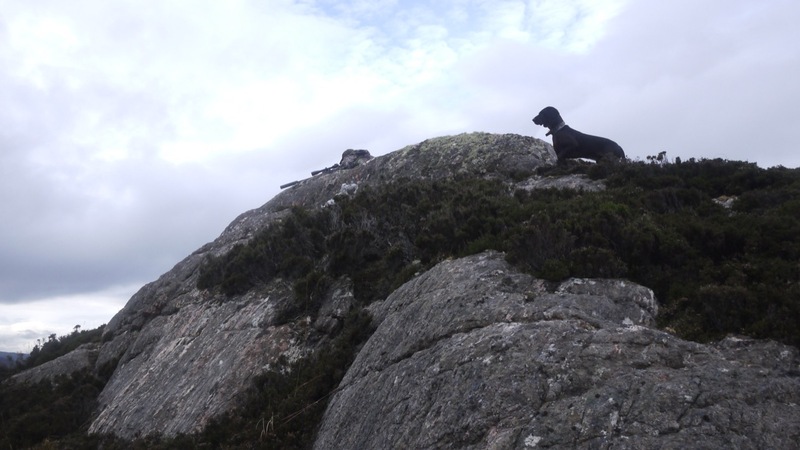 However it was a good stalk and unfortunately the stag on being shot fell down into a deep valley so the drag above was a walk in the park compared to the drag out of Oscar’s stag!!!!! Mark who was helping us this week was called and the 5 guys needed it all to drag the latest stag out. We would never leave a stag whatever the terrain, even resorting to cutting it up on site, (take note JMT!!!!) if we had to. Although this weeks group were here for the stalking the majority were here for a holiday, the walks, fishing and of course the Rona produce, which at this time we have plenty of. Every night there was a full table with much wine and good crack, getting a stag each day gave the hunters plenty to talk about with the story of the stalk being re-told quite a few times. Next day, Wednesday the 5th October it was Mark’s turn to take the guests out. First of all I dropped him and the guests off the boat on the West side, they drew a blank but on the way back they saw this calf struggling, on closer inspection they saw it was missing the bottom part of its leg. With no prospects Mark took the shot and probably saved the calf a very poor winter. The fences on Rona are necessary to keep the sheep in and unfortunately the younger deer struggle sometimes to cross them. We have done away with most of the barb’ but they still get caught. Once they dealt with the calf we dropped them off at the mouth of the harbour , Daniel and I (who was here for the fishing with the group) sat out in the Sound fishing and watching the stalking party looking for stags, very interesting it was too (no fish)!!!!! We had agreed to meet Mark half way down the South road and headed down late afternoon. On the way we saw the ‘TV Screen’ holding hinds way above the track, they were very interested in us, he was roaring away good style. Hans and I (the Father of one of the guests) spent a good hour spying from the highest point and chatting. 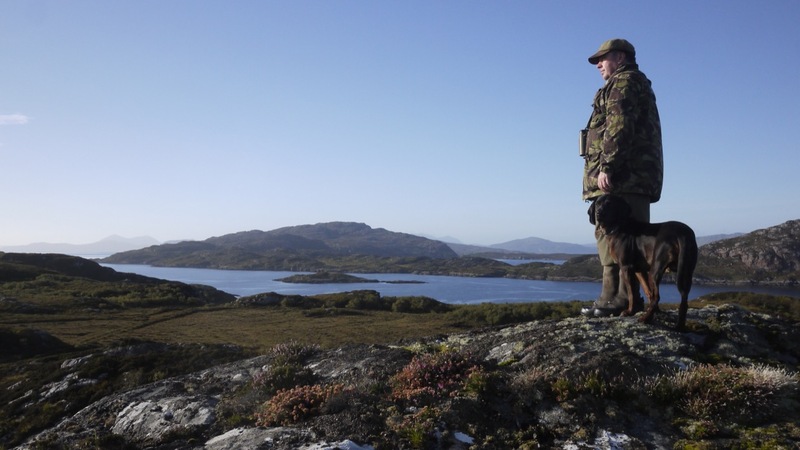 We saw plenty deer (and so did Mark) but did not hear a shot, so after much discussion about deer, sheep, cattle and the meat trade (Hans was a butcher in Copenhagen) we headed South only to bump into a very fine stag off on the East side of Rona. Shortly after Mark and his party came into view. We do have quite a few stags we need to cull to keep the balance in the herd and there is always the temptation to not cull a good stag or two every year but in our case on such a small Island it is necessary and there is always a lucky guest who gets to stalk such a fine stag, to-day it was Karl Johan’s turn. 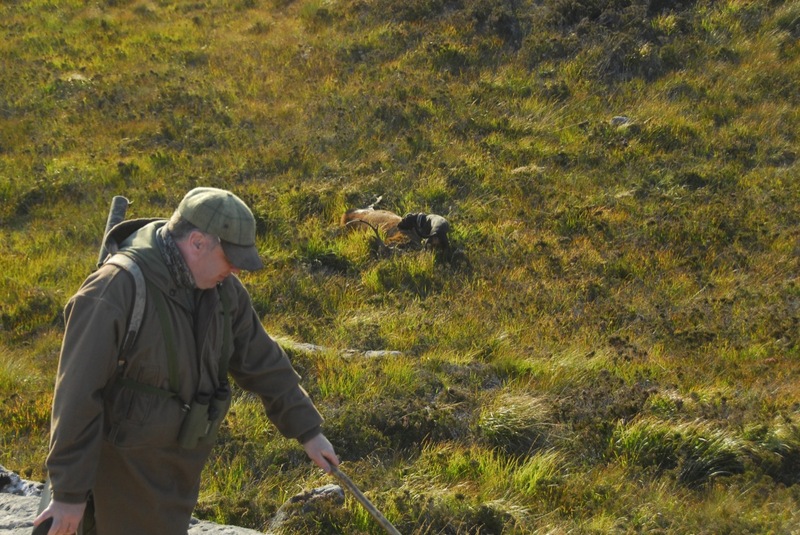 Mark had spent most of the day looking for a good stag but had been unlucky and as it sometimes happens at the end of the day a good stag fell into our lap. The stalk was good, the shot perfect and we were back at the larder in no time. A successful end to the very long day for the stalkers. Karl Johan was a very happy guy and gave us a demonstration of how to open champagne, quickly. Unfortunately my attempt turned out to be very wet, I sort of missed!! It was an early start planned for the Saturday morning so we had a very late and wet evening as you do. It was the end to another very good week. First thing with pretty fuzzy heads we loaded the carcasses onto the MV Aspire and away our guests did go, heading for House of Bruar on route to Edinburgh. All that was left was to tidy up and to prepare the heads for sending away to Denmark, Saturday was approaching and all too soon Mark was going away, Wallace was coming with two German hunters, one of them Frank had been on Rona before, last time by Kayak!! Once again a test was taken then a trip up North, this time we had the boat and calm weather but it was to no avail our North end stags were very quiet. Later that day the stalkers on their return to base decided to head out North with the wind and head back down the seldom stalked East side. It is difficult to extract the deer here but they were keen. I headed up to a high hill South of them and quickly saw the group in the valley approaching from the East, it was obvious they were stalking and next thing I heard the shot. I got the call shortly after that to say they had had a good stalk and had got their stag. We quickly picked it up and back at the larder we had one very happy Heiko. On the Monday I dropped the stalkers on the North West Shore, unfortunately they bumped into deer too quickly which probably alerted every deer in that area. Now they had a challenge. 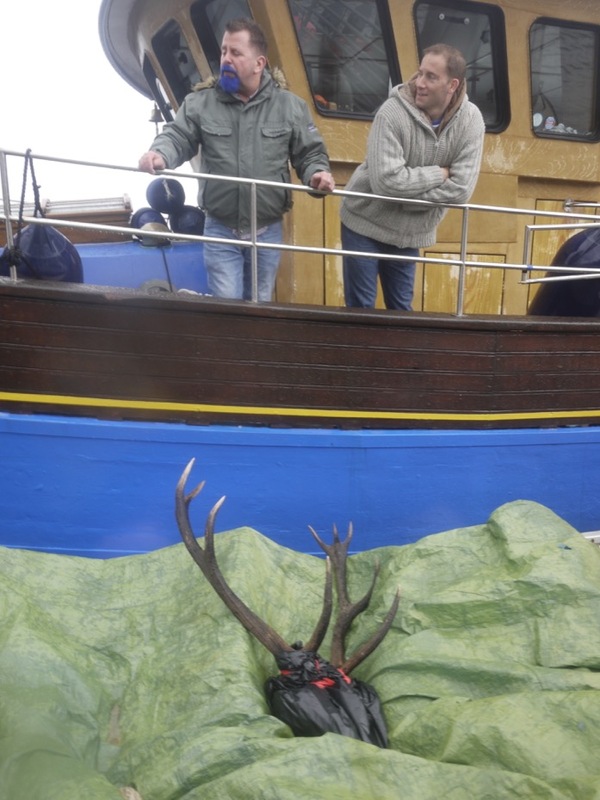 Back to Big Harbour for me to await the radio call that they had a job for me to take a stag home. It is getting late in the season for the yachting fraternity but when I arrived back the Yacht Sula which had been in that night was messing about at the mouth of the harbour, seems there was a journalist on board who was taking pictures of the yacht for an article in Yachting Monthly. We did not see much of them despite bumping into the journalist on the pontoon. Maybe the tweeds frightened her!!! A few hours later as arranged I headed up to Meal Acarseid, our highest hill. I got a call from Wallace to say he had seen many deer but they were pretty switched on and despite two good stalks they were still blank. I could not see them from my high point but after 15 minutes they came into view and as always it is interesting to see stalkers approaching areas unaware that there are deer in front of them and despite the wind the deer are aware somethings up!!! I did see a very big stag above Dry Harbour but was sure that the stalking party would give it a wide berth as it looked a very good stag. However about an hour later I heard the shot then saw activity and then got the call, we have shot a Royal!!!!!!! It was not a Royal but a 16 point stag, a cracker. Our stalker Wallace, had taken the decision to shoot him as he judged that this stag was quite old and as it subsequently turned out he had had quite a long life and although he had been the master stag here two years ago it was plain he was keeping a low profile and as we had to date seen quite a few very good stags the decision was made. Often it is difficult to make that decision but once you do………. After the usual photo’s we had a short drag back to the bike then a longer pull as we could only get the bike close. 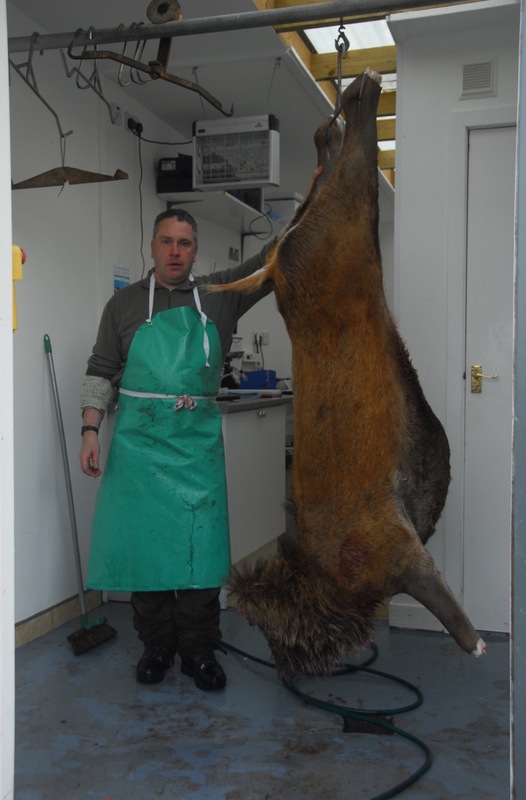 Back to the larder and we found we had a very big stag which took quite a while to deal with. Next day in his place TV Screen was doing the rounds, he was to the East of the Island for a week roaring away, this day just to the middle west of the Island roaring at another Royal who had taken up residence above the old forest West of the Lodge. We had a few days left and although our German stalkers had only wanted to shoot two stags they got a bonus as we had a thought that we did need to shoot some more younger stags, so two 3/4 year old cullable stags were found. 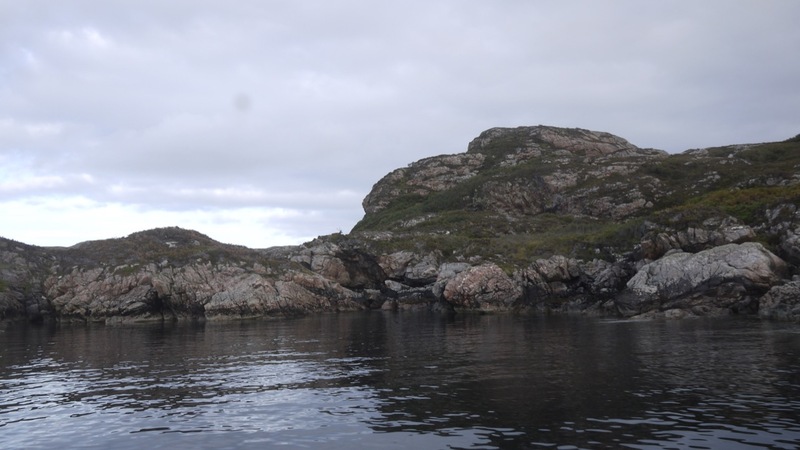 We also had a look on the Island ‘Garbh Eilean’ but no stags were in residence, the weather was fine and when they were on the Island I enjoyed a spot of fishing. Back to the Lodge and TV Screens adversary ‘Torn ear’ was now above the house with the small group of resident hinds, he was quite safe, we do not shoot around the house and we were well aware that ‘Torn Ear’ was now the Master Stag for 2016. That night we dropped our guests off at their cottage and the stags were roaring big time, Wallace tried his hand at roaring, much hilarity!!!!! Although the sunrises are spectacular just now we were getting good sunsets too, the hind and calf in this picture were enjoying the late sun. Getting near the end of the week and the guests were cleaning their trophies, the ‘TV Screen’ was over from the harbour on the East side in full voice, ‘Torn Ear’ back on the hill above the old forest. All day they were bawling and it was just a matter of time before they had a fight, we did not see it but by that night ‘Torn Ear’ was in charge on the East side. Even when the guests were still here I go out for a look, if I wake early I shoot off North or South and have an hours spying, the early morning is a good time to see wandering/travelling stags and at this time, mid October I was happy to see we had quite a few young stags wandering about. Frank and Heiko cleaned the heads for the week and the previous week, next day the boat was coming, a day early but there was no more to do and our guests could get an extra day across Scotland and see more of the country, Wallace back to Base. 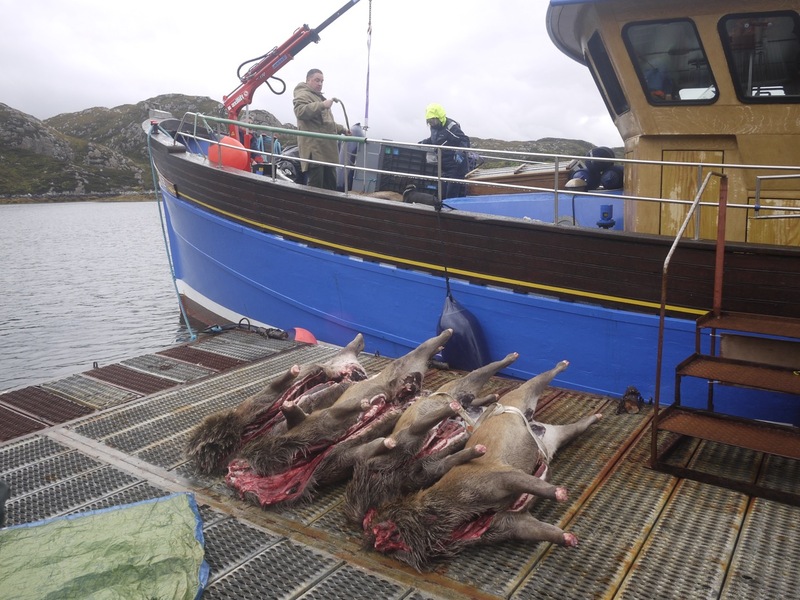 Stags loaded the boat departed and we could stand down. Next day on the way over to Dry Harbour I heard roaring down South so a quick detour as I had the Nikon camera and not far from the track ‘Torn Ear’ was in good voice, not happy that there was a young stag lurking on the edge of the group. Our next and final booking was for a family visit that was coming Tuesday, the weather was a bit iffy but it turned out fine and after a long drive from Edinburgh our latest Danish visitors arrived. A quick test and we were off, the stalking by this time was very difficult, the Island had been well and truly covered, the deer were very wary. We could not shoot any more big stags but there were quite a few younger ones about. 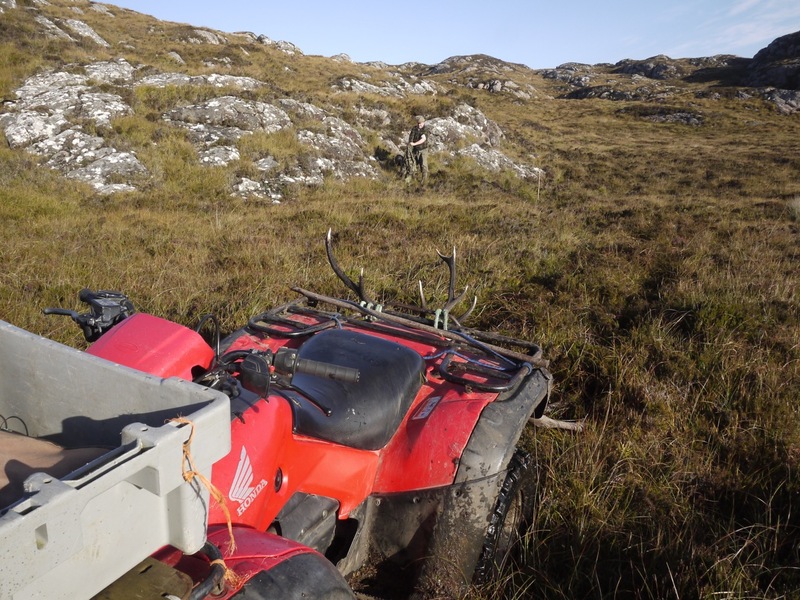 Despite hours of walking (12k one morning) we drew blanks and it was only on the 21st after the stags had finished that we got a hind for the freezer. Too Short, Then They Were Off. It was after all a family visit, the weather was very fine and they enjoyed the peace and quiet very much. It is not all about shooting deer at this time, Rona, as is Scotland is lovely in its Autumn colours and if we get good weather as we did this October it is quite stunning, great to be out on the hills. It has been one of the best Ruts ever in my life certainly on Rona. The new guests arrived on Saturday, for a holiday and ‘Torn Ear’ was in full voice out on the flats beside the track. He was not bothered about the various passersby on the track. He had other things on his mind! By the end of the season it is good just to leave the stags alone to get on with what they do, a month or so of rutting takes its toll and they are pretty tired and I guess easy prey for the unsympathetic stalker. We would prefer to stop stalking earlier but we are now having to use the whole season to get time to control our deer population. Hopefully now after this years rut we have the final part of the Rona Red Deer picture and can adjust our Deer Management Plan for the future. The picture of ‘TV Screen’ was taken on the 23rd Oct’, he was still with hinds at the South end this time, still rutting it has been a long rut. That’s the story this season, been the best ever. Super weather, good company, excellent stalking and no disasters, well only one!!!!!!! Roll on the Spring we will then know what awaits us next years rut. The hinds are now over, it is getting late for shooting, so I’ve knocked it on the head. There is no pressure on the habitat but we need to make sure we maintain a balance on the ground. I feel that next season we will have to increase our numbers but will look at this after our annual deer count. 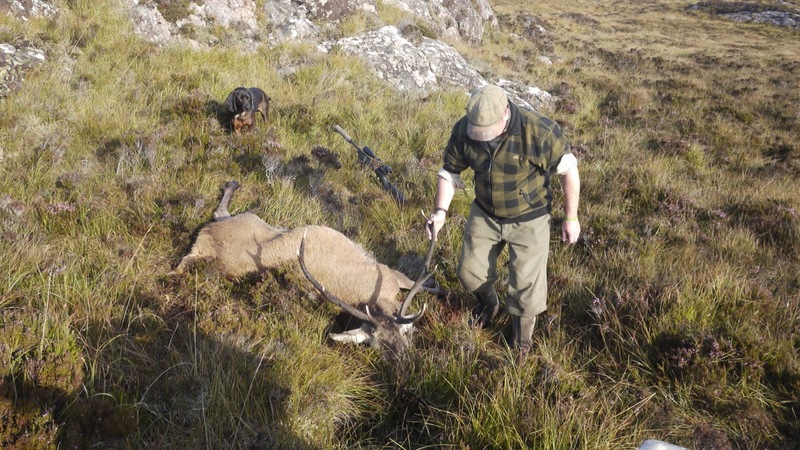 This last few weeks have been taken up a lot with the news that the ‘John Muir Trust’ shot 86 stags last season on their land at Knoydart and left the carcasses to rot. To say I was upset about this is an understatement. But the good thing is it has galvanised me to get ‘Rona’ joined up to the Association of Deer Management Group and spread the word about deer management and the future of it. 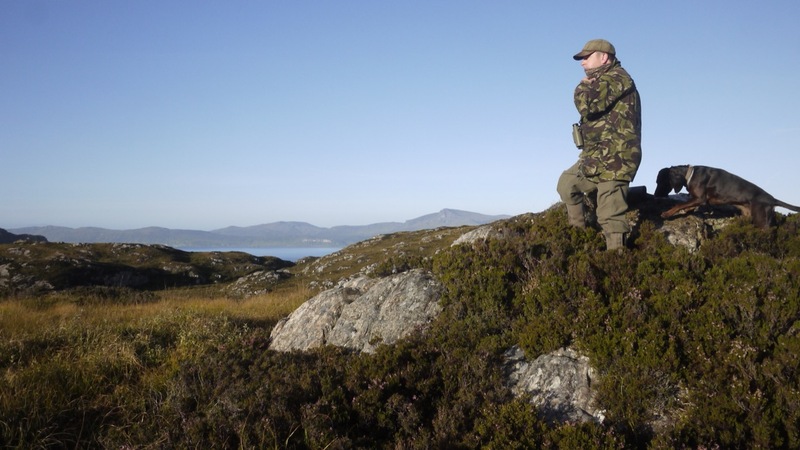 With heavy emphasis on Deer Management within the Land Reform Bill going through parliament it is one to watch. But for the record here are the gory details, replies, rebuttals and other information by way of these links. It was of course the Press and Journal on the iPad in December 2015 that I saw the article, since then it has been in quite a few papers. On looking at the Scottish Gamekeepers web site there was quite a bit on that and their reply is pretty thorough. Of course it is easy to criticize the John Muir Trust, so here is their rebuttal on doing something which is quite wrong (in my eyes). On another topic, I contacted Jose L Souto after reading this wonderful Venison (Cook Book) below. It is simply the best one I have. Excellent recipes but it also has a story to it which is the way cookbooks seem to be going nowadays. I got a surprise when I saw that he stalked at Gairloch, so I wrote to let him know about the John Muir Trust/Knoydart issue. His chapter on deer management should be read by the JMT for sure,(and all stalkers) he had heard of the issue and was horrified. I strongly recommend this book for anyone interested in deer and looking for recipes to cook the quality end product. it is directed more to South stalking but overall it is a worthwhile edition to a cooks table. The photos are very good too. The Rut is over for 2015, there are a few stags still about but no roaring, they are keeping a low profile. Back in 2013 I came across to Dry Harbour early in October to see if I could spot stags. I came up past the ruins and I could hear clicking, quite loud. I knew in my head what it was but I was completely thrown, I walked on. I was just about to go over a ridge and I spotted some hinds up on the hill, the clicking was louder and there seemed to be grunting. Then it came to me, there are stags fighting. I looked over the ridge gingerly, there was Eric, our old Master stag of the last few years fighting with a new arrival. A very wide headed stag. He was a beauty, a Rona stag perhaps and bigger but younger than Eric. I was disappointed that it was not brighter but I had the big camera so I upped the ISO, bracketed and hoped for the best. It was a fantastic fight with Eric finally getting beaten and the new stag taking over, to date this same stag is on Rona, holding hinds and seeing off young pretenders. Sunday 18th October, it is nearly over, the ‘stag’ season ends on Tuesday but the stags on Rona know no seasons, they are still roaring big time. To-day we had three stags around the bay letting us know what they were up to. It certainly has been a traditional rut, the first for a long time and probably a lot to do with the late ‘non’ summer weather we have had. This young stag keeps popping up, seen at the side of the road on route to Dry Harbour one morning last week, he was right at the South end a day later lying up looking very relaxed, no interest in the rut. Whereas this fellow was up above the windmill at Dry Harbour, looking very tired. In fact he ‘dropped off’ as I was watching him. He was lying down alongside one of our old tagged hinds. She is at least 14 years old and still looking good. It seems that we have some very fine stags on Rona this year. Over to Dry Harbour on Friday and I was pleased to see last years master stag back on his old hunting ground, staking his claim. He had been absent and was thought to have ‘gone’. But here he was making plenty noise and unconcerned that I pulled up on the bike. It is as though they know you are not in hunting mode. His hinds went off though and he leisurely followed, bawling all the way. A very fine stag, next day he was behind the house making plenty noise again. He certainly does the rounds. Earlier in the week I was intrigued to see the ‘local’ pack of hinds back together on the road to Dry Harbour. They had been missing for a while, probably a stag had been pushing them away, now they were back and unconcerned to be feeding round the target. After many sunny days it was no surprise to get a foggy morning, I was hoping to see a stag in the mist but despite a good search over the Island there was no stag hanging about the low lying foggy places. They were all on the higher tops. The rut on Rona this year has been one of the longest. It took a while to start and it probably could be that it is a bit late. But traditionally it is the right time and continuing as it used to do. Good to see the deer in such good condition after a dreadful summer, are they piling on the food/fat for a poor winter? We will see. Rona Red Deer: There were already Red Deer on Rona when I arrived in 2003. I didn’t know this and thought my days of stalking were over. It was when walking up to the Base one late September day in 2003, that I came across some deer marks in the mud and the smell of a ‘run’ stag. It was only after a visit to Portree later in the year when I met Dr Angus who told me he had seen a stag in the summer, on the East side of Rona from his yacht, that it was confirmed; we had deer!! I had been working in forestry prior to coming to Rona and had been heavily involved in deer management with Scottish Woodlands Ltd, but thought I had given up on deer when arriving here. However that was not to be and after chatting with the owners of Rona about the woodland management, we made the decision to buy in two stags and six hinds from John Fletcher at the deer farm in Auchtermuchty. Little did we imagine that the island and the deer would mature to the level it’s at to-day. The herd are integral both to the health of the woodland and to the growth achieved as part of the grazing management. The end result, our venison, is very popular and with income being hard to find on Rona, the deer herd has proved one of our best assets; not only financially but also in being able to observe the deer and how they develop in their natural environment. However, we do have to manage them and that entails culling. We do our very best and understand fully our responsibility to the herd and to the island forest in which they live. More about their re-introduction later. Part of the thrill of stalking in the rut is being out in the countryside at a wonderful time of the year when the summer is past and the Autumn colours are coming. The weather has changed and it is a cooler, cleaner time. Our recce up to the North end on Sunday was quite a surprise after the previous weeks forecast. It was looking like SW wind and rain for the week and since this picture was taken, we have had a perfect week with Easterly wind which means mainly dry. Just one poorish afternoon all week. Rona is not a large island but what it lacks in size, it makes up for in rough ground and character. There is a lot of dead ground and the underfoot conditions are pretty challenging. If anyone is coming to Rona to stalk then they need to be fit!! The size of the island is quite disorientating almost everyone who comes here stalking with us asks ‘are you sure this Island is only 2000acres’? I guess if it was to be flattened out it would be a lot bigger. This is what makes a very interesting stalking challenge, there are so many corners, nooks and crannies for the deer to hide and surprise us. We got underway on Monday, and had seen quite a few stags who appear, as usual, out of nowhere. We have to pick our deer and with the stags chasing hinds, the advantage you may think, is with us. But all too often either the wind changes, the light goes, or there is a very alert hind only too happy to run off taking all with her. Such is the nature of what we do. With stags roaring it makes it easier for us to find the areas where shootable stags would be and that found us back up around the Applenet internet mast where a potential cull stag was holding some hinds. After a long and often interrupted stalk, Wallace, who had arrived on Saturday, got into position and waited, then waited, then waited some more. The stag was lying down and with no prospect of a safe shot he had to settle down and wait until the stag stood. After what felt an age, the stag stood up but it looked like it was going to head off as it was looking straight at Wallace, knowing something was not right. It took a few paces and Wallace ‘roared’ to stop it, it turned and the shot was taken. A successful start. I am the ghillie this week so I had to go and get the bike to extract the stag but left Wallace to deal with the gralloching. It was a poor head but body weight and condition proved otherwise. In fact all the deer on Rona look in good order even after the poor winter we had. That may be a reflection on the numbers that we maintain and the available forage. The impact on the ground is noticeable but not a problem , in fact the many deer paths make for a much easier walk off of the main paths. The fact is we need to keep a balance of deer to the area, feeding and the trees. The balance is not easy to determine, numbers certainly come in to it but a gut feeling, perhaps keeping an eye on the impact, whatever it takes, the numbers need to be agreed then we take it from there. This year we hope to cull 20 males and to increase the hind cull. There are various deer density numbers bandied about but in reality it is the people on the ground that can only determine the cull numbers based a lot on local conditions and deer movement. Back at the larder we quickly processed the carcase and had it in the chill cooling in no time. It weighed in at 15 stones a good cull stag. Next morning it was another beautiful start, quite cool and not a lot of wind. 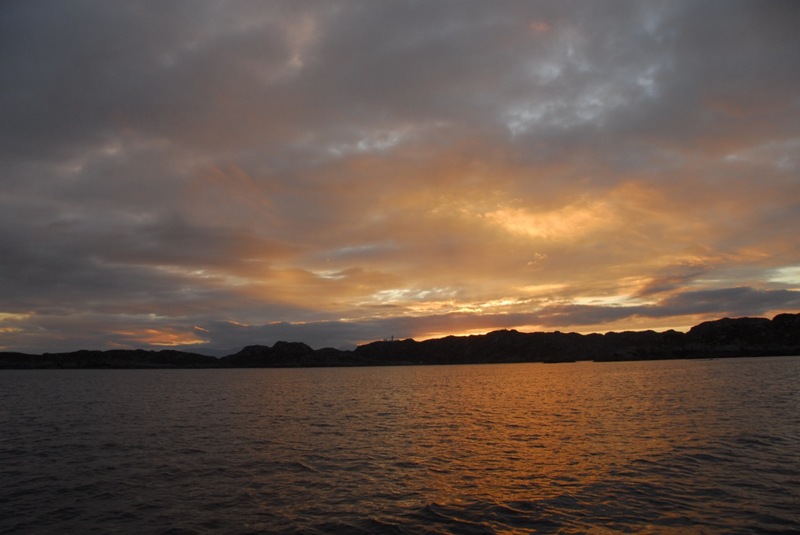 The sun was up early and with the slight south breeze I decided to head across the bay on the boat and drop Wallace off, making it easier to approach the sound of stags roaring in the south west corner. I met Wallace down the South path a couple of hours later, he had called me up on the radio and said he had drawn a blank. Once I got the whole story it turned out that there were quite a few deer around, a Royal stag holding hinds with a few younger stags on the periphery taking their chances. The sun was very strong and with the approach from the West it made it difficult to see through the glass so the deer definitely had the advantage that morning. I suggested a walk up to the Loch and then back for lunch, just for a look!!!! We headed up the East side but the wind was swirling and making it very difficult to not give the deer our wind. As it happened we saw nothing, plenty of marks but no deer. No surprise. As we got higher and nearer the Loch before we would turn for home we saw a hind up on the North path, Wallace then spotted a stag lying down behind her. We watched them for a while with the wind right in the back of our necks. After about 15 minutes, when she never gave up her stare in our direction, she turned round and took off into the nearby trees never to be seen again. We were hungry but decided to press on as we could see rain coming up from Applecross and thought we will head home in another hour. An hour later we were at the Danish Princess’ grave spying out to the Northwest, contemplating what we would do (in the future) if we saw a stag and shot it up there. It is impossible to get a motorbike/argo or any vehicle this far North. We were talking about how to get the stag or hind to the shore and how we would need calm weather, when Wallace spotted some hinds. There were three groups, the last one had a very cullable stag with them and they could not be further North. So, with every intention of heading back we changed our minds and headed out to the downside of the deer. The wind again was swirling and proving very difficult to approach the area. We made , long detours and eventually got to where we thought the deer were, only to find they had gone. We could not understand it, surely they did not get our wind. By this time the wind had really got going, I was a bit concerned if we did shoot something whether we would get it with the boat. We then heard splashing and here was our deer running into the water and swimming across the Sea Loch well out of range and safe for another while. With the stalk now over we turned for home just as the rain came on heavy and cold. We were getting pretty hungry and thirsty, the track from the North is rough and quite tiring. We got down to the start of the valley leading back to Dry Harbour when we spotted three deer lying down some way ahead. Back we went round the forest, down by the stream and then through the woods. Up onto the knoll above them but no stag there. Just then we saw another party of deer up on a rock face and to the East of them a stag. They were sheltering from the rain which was now coming down quite heavily. We watched for a while, trying to make a decision what to do. Then we saw another very good stag behind the first group. Nothing for it but to backtrack, yet again, and head North to get behind these deer. Half an hour later after a lot of dodging we got into a position where we could stalk into the deer. It was not to be however, there was a young stag we did not see right in front of us and he took off taking the rest of the deer with him. We decided to press on and go home another way but on climbing to the top of the next hill we spied a huge stag with hinds crossing the valley from North to South, then he lay down as the hinds were feeding. Here we go again, with weary legs we retraced our steps but managed to cut a bit of the ground off by taking a shortcut down through the forest. By this time we were soaking, hungry and very tired. We went forward there were three biggish knolls in front of us before we could get into position. En route we spotted another couple of young stags up on a North face, watching the proceedings but we were confident that if they did see us and leave they would not take this stag with them. As is almost always the case in these situations, the final shot is the anticlimax and so it was today. We got in close then spotted the hinds but no stag. Wallace crawled forward slowly, I held onto the dog and I could see him getting ready, but again he had to wait. Only when there was a chance of a safe shot did Wallace shoot and we had another, very old stag to add to our numbers. The stalk was long and arduous but satisfying to get have a successful end, now the hard work begins with the gralloch, the long walk back for the bike and trailer and the larder work to follow. 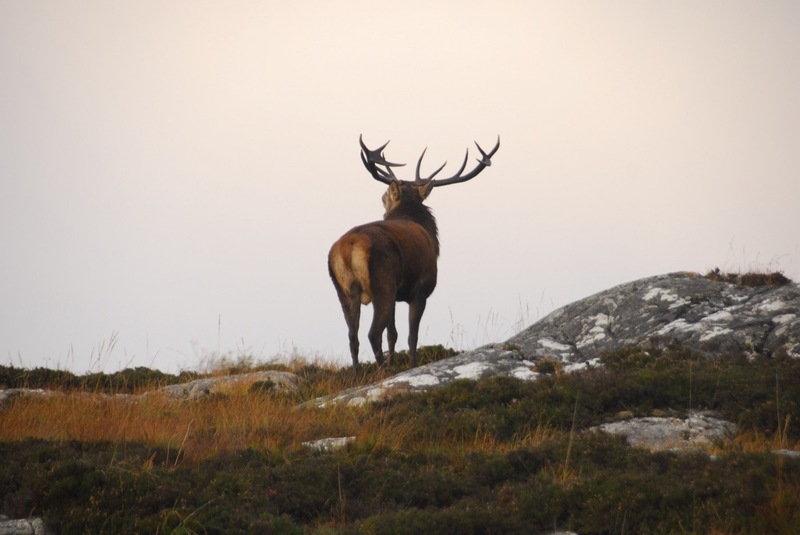 By Wednesday the stags were in full swing and there was a lot of roaring around the island. We took a run over to Dry Harbour for a quick spy first thing but we had made up our mind that we were going to the East side where we had spied several groups of deer the day before. 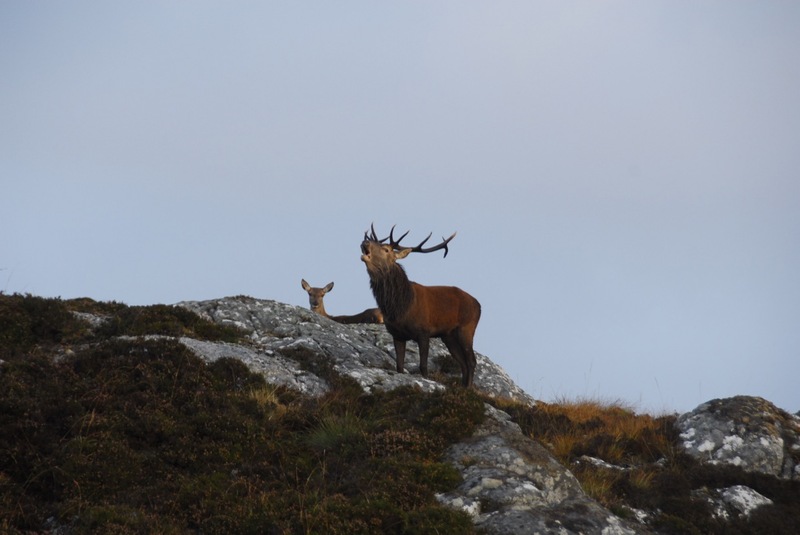 On the way over we saw this years Master Stag holding hinds below Meal Acarseid, our highest hill. He was very vocal and obviously knows he is quite safe this year, he stared us out as we sat on the bike giving him the once over. By the time we came back from Dry Harbour he was gone. We decided to leave the bike a little way down the South path and we were walking just round the first corner when we walked onto two hinds. We did not think we disturbed them too much and held back a bit. We were kicking ourselves for being a bit complacent, at this time of year the deer can be anywhere. We climbed further off of the path and straight onto more hinds but this time we did not give ourselves away, so there were more around and obviously not disturbed by the two we had disturbed. We had a crawl and much longer walk to get round them, a bit of mountaineering up steep wet slopes to get past and out of their wind. Once round the back of the hill we moved forward and quickly got onto two young good cullable stags. Wallace crawled into position and picked out the first stag. He took the shot and the other stag ran off and stopped broadside at 175yds. I gave Wallace the nod and he took another clean shot. It was still early in the morning and we were well ahead with our annual cull. Although Rona is pretty rough we try our best not to have to drag the deer too far. We can normally get the ATV/bike into where they lie. Sometimes we have to retrieve them by boat but that is another story. These two were our easiest extraction, possibly one of the few places on Rona where the ground conditions are not peppered with rock. Must remember that for the future. 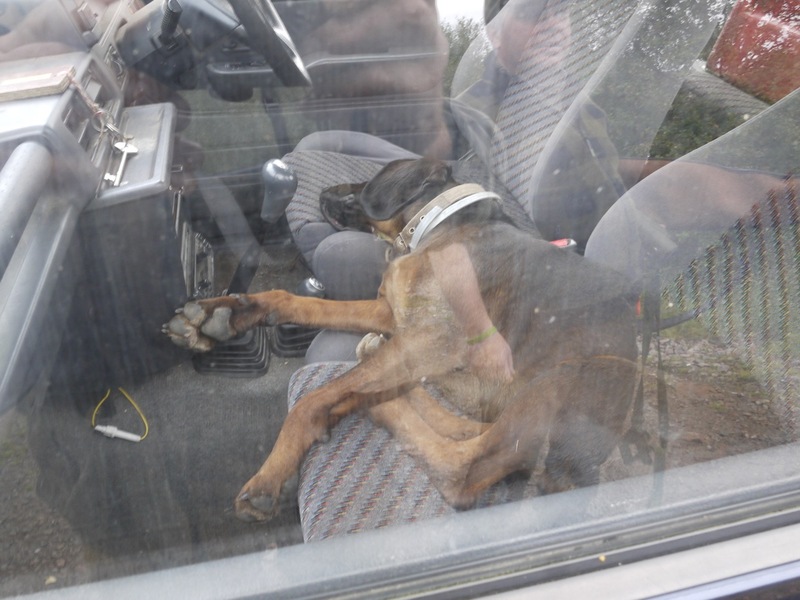 After Tuesday’s marathon walk, Wallace’s dog Magner was clearly bushed and any excuse to get into the jeep for a sleep and he was there. Up at the larder when we are cleaning the deer, he took off into the jeep for a siesta. Felt like doing the same ourselves. 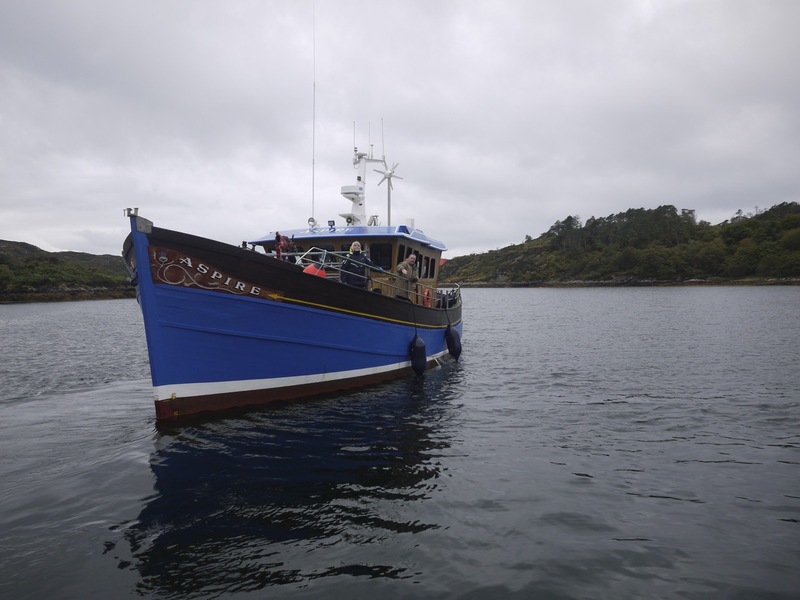 We got the deer sorted out and for the rest of the day we took it a little bit easier just using the early finish to catch up, to go out on the boat to spy the coasts and we took in the last fleet of creels at the same time. Thursday early we headed further South, it was another stunning morning. There was no roaring and it seemed suspiciously quieter. But it was not to be, we came up a slope on the South path and here was a hind feeding not far from the track. 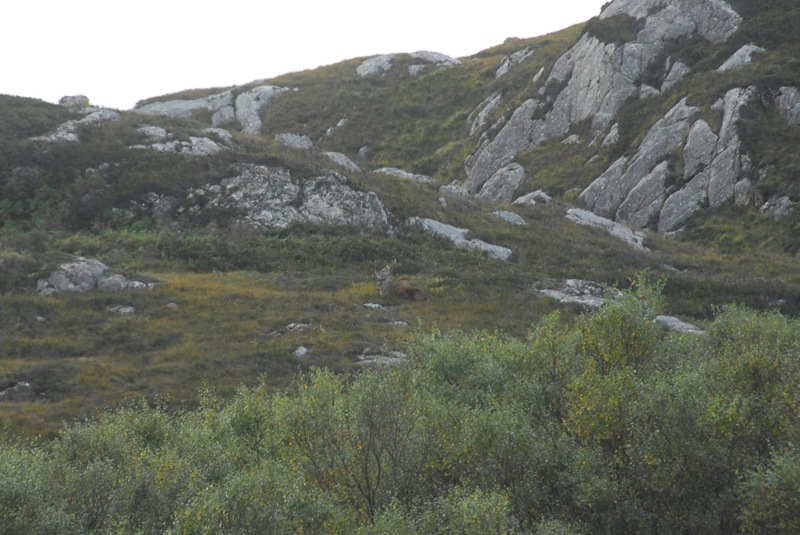 As we stood spying out of sight, a young stag appeared on the ridge off to our West side. He stood and looked around but went away, obviously a bit restless in the rut. Further down the track near the old village of Doire na Guaile we saw some hinds. Down we went, there seemed to be quite a few, surely there would be a stag with them. A few minutes later, taking up the rear, appeared our final stag, another cullable stag. 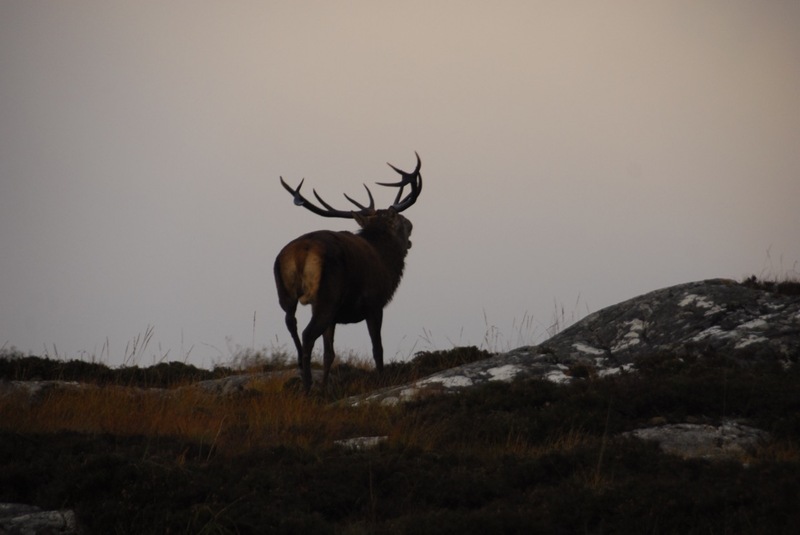 This year we have some very fine stags on Rona but also some poor ones, if you judge them by their heads. However, the body weights have been pretty good and we have not seen any deer that looked like they had had a poor winter which is quite surprising given the atrocious weather we had up until September. With the sun coming up on a clear day we made the decision to take the shot from where we were and not to try and gain another 60 or 80 yards crossing open ground. 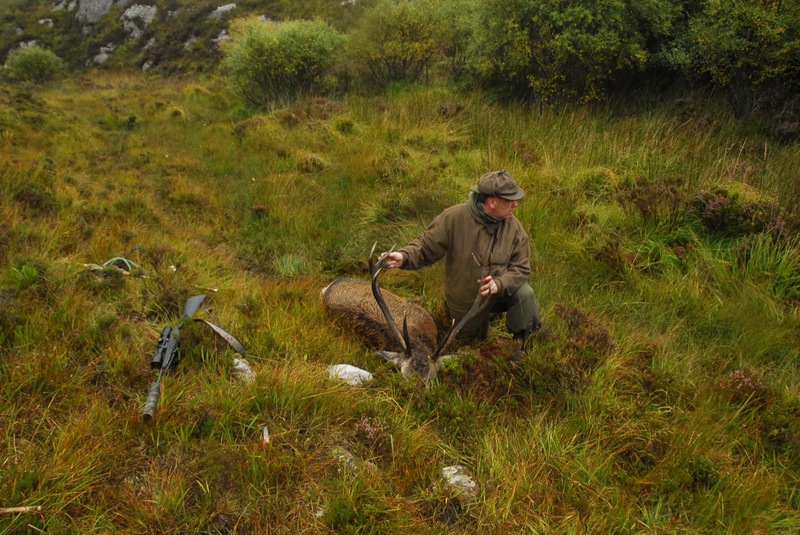 Without further ado, Wallace completed his weeks work (shooting) and dispatched our last stag of the season. Again another relatively easy extraction, much easier than the North end which is one we will have to work on. We got the stag on board and decided as the morning was so clear to have a walk further on but with no rifle this time. We had a good spy over to Raasay but all we could see was the local shepherd, gathering sheep. Although some of the sheep were looking down on him from the highest point, all bunched up and not playing the game. We had been sitting for a while with the noise of a boat in the background rather than roaring stags when an Ullapool dive boat appeared, close in looking for scallops. We moved further out and came onto a hind lying down enjoying the early morning sun. We crawled in to see if there was a stag with her but when we got to our chosen spot we could see that she had seen us, was not happy and was off, closely followed by a big stag that must have been lying in cover. Once we got the larder work out of the way we decided to go out on the boat for one final look and to drop Wallace off on the East side (with no rifle). The weather had started to turn overcast with a promise of a change. 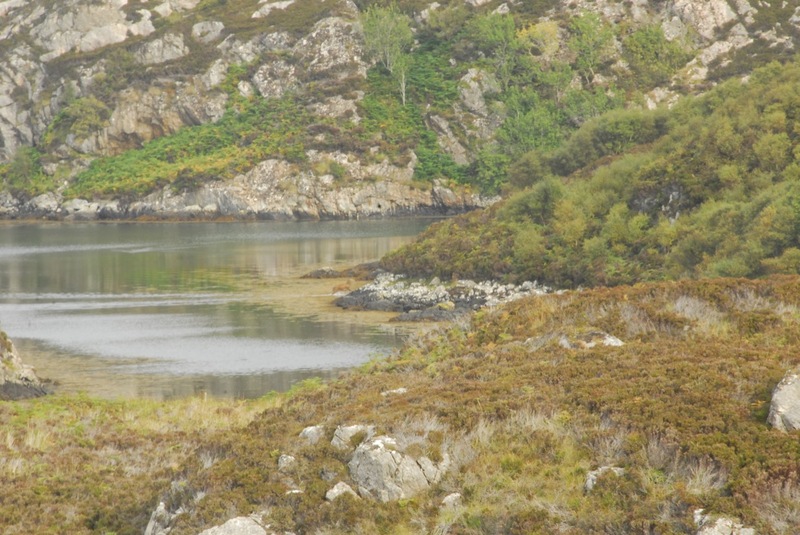 As we turned to come back from the gap (between Rona and Raasay) we saw our stag from earlier, we do not know if he was thinking about swimming off but he was certainly right down at the shore. Again he did not hang about, he took off quickly and made for the woods. The stalking on Rona is very exciting, the cover is immense and the stags who are posted missing most of the year, appear out of their hiding places deep in the forest. Although we would prefer to shoot our stags earlier in the season it is necessary to complete the cull now just in case our numbers have taken an unexpected jump. This season, like previous ones, was normal and if we keep on top of the herd numbers as we do then we are hopeful that this will remain the case. Stalking here requires fit legs and constitution, apart from the walking there is the weather and logistics to consider. The work before and after the stalk is much more than event. The carcases need careful handling, the by products need to be dealt with, then the delivery to the game dealer needs to be considered. Living on an island, it’s not simple getting our deer away and that is our next challenge, especially when tides, weather and time can be against us. The antlers are cleaned, assessed then sold, the venison we try to process ourselves but at this time and with holidays looming we are pressed for time. This year MV Aspire’s crane was very welcome and we had the five deer loaded in no time, much to Mel and Lee’s (our cottage visitors) amusement. Don’t know about the beard!!!!! Half an hour later everything was aboard and Wallace was on his way to Muir of Ord to deliver the load. Unfortunately it did not go quite to plan and we were given the wrong number to get the Game dealer out to take in the deer that night which threw up all sorts of problems but it was resolved first thing in the morning. Wallace Heading Home Pleased With The Week That was. After 12 years of deer on Rona we have a healthy herd, in good numbers. We get a lot of enjoyment out of monitoring them and watching them interacting. The culling is necessary for the good of the herd and just like our sheep they provide us with an income and a very good healthy venison product.